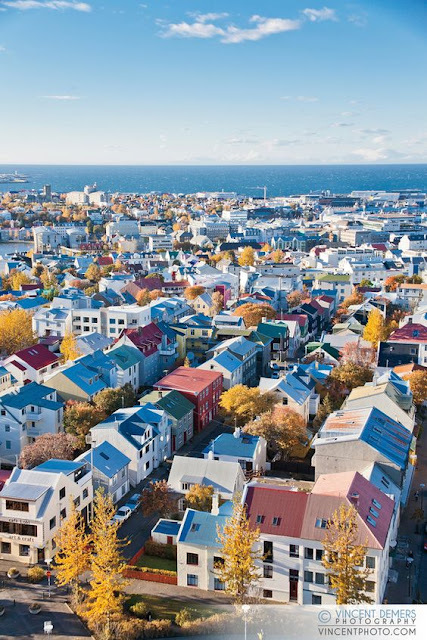 One of the most effective ways I have found to improve my sleeping pattern is undoubtedly keeping what I do before I try to sleep habitual in routine; keeping to the same times and tendencies each night to let my body know I'm winding down (and hopefully in return it will let me switch off). It's no revelation that sleep has typically been a battle for me more or less from when I started university, and dips of insomniac tendencies creep up on me now and again, usually aligned with stress or changing circumstances. Through the week, I'm relying heavily on routine to get me through early starts and full-on days as functioning without my seven hours would be near on impossible right now. 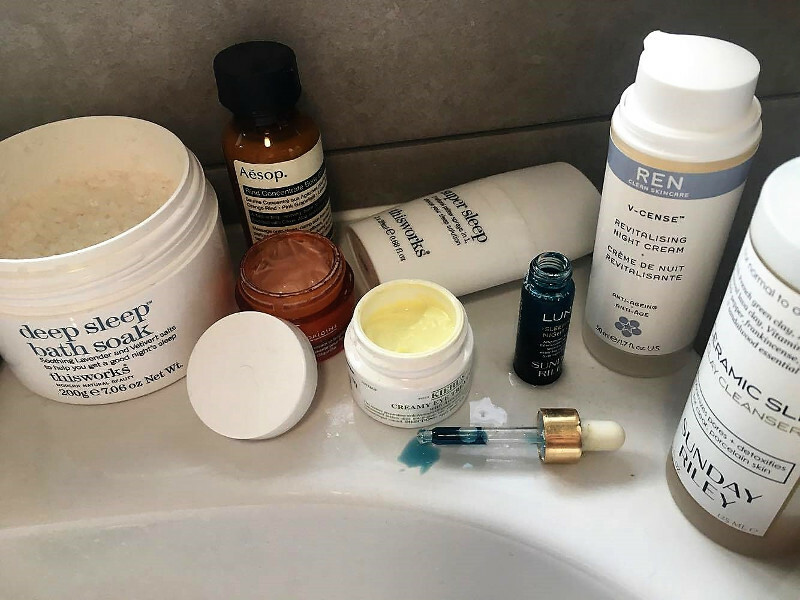 Before slumping into bed (at the wild hour of 10pm), I've been gradually going through some trusted lotions and potions to start off on the right foot. Hopefully these recommendations will help any other night-owls out there. 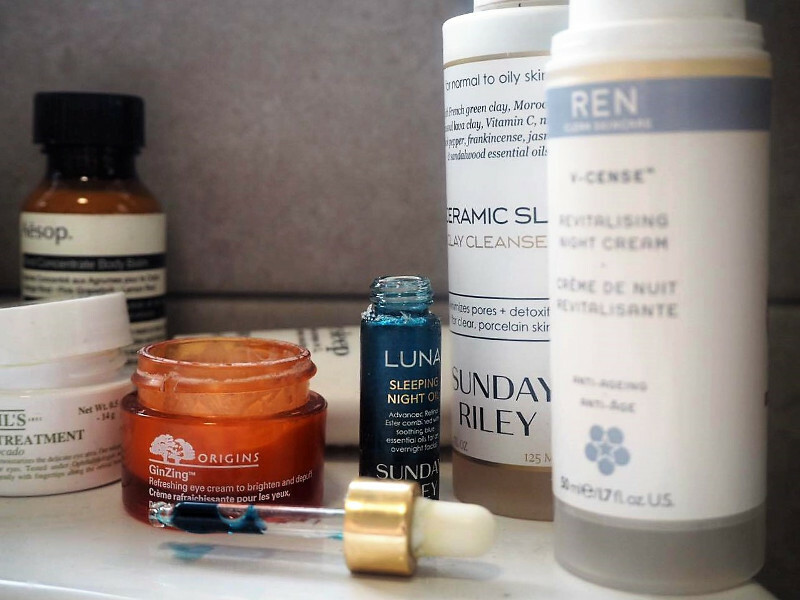 REN's V-Cense Revitalising Night Cream is formulated with Frankincense, an ingredient that arguably has a relaxing and 'sleepy' aroma and works for me in the same way as the This Works Sleep Balm in signaling to your brain the time of day. 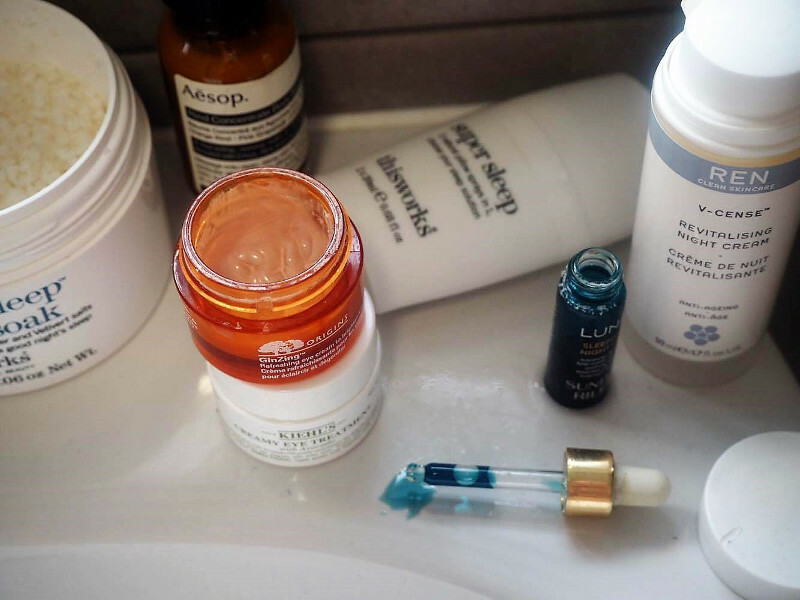 An overnight treatment that's hydrating, soothing and has a velvety texture; I use it habitually every night as the last step in my skincare routine. 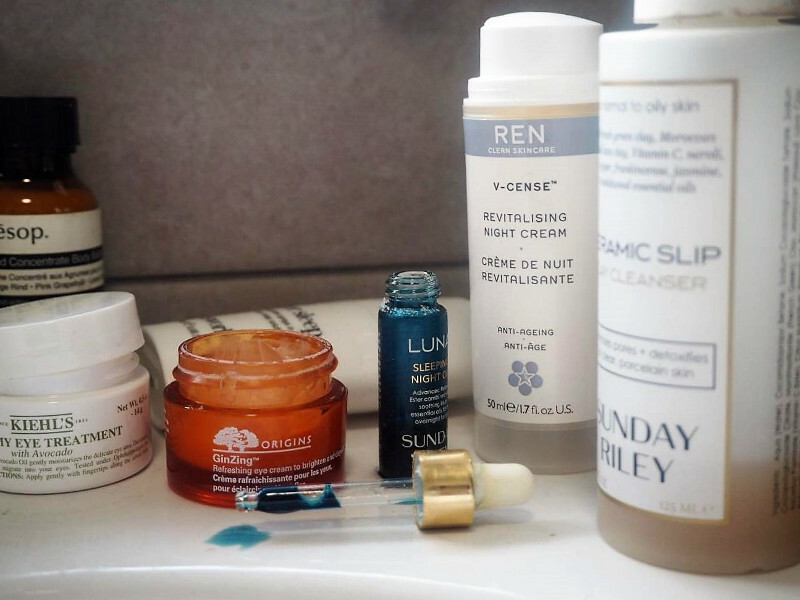 With little time in the mornings, the luxury of applying eye-cream only tends to happen in the evening and since I've been doing it regularly, I've noticed a difference in both the appearance and feel of my under eyes. 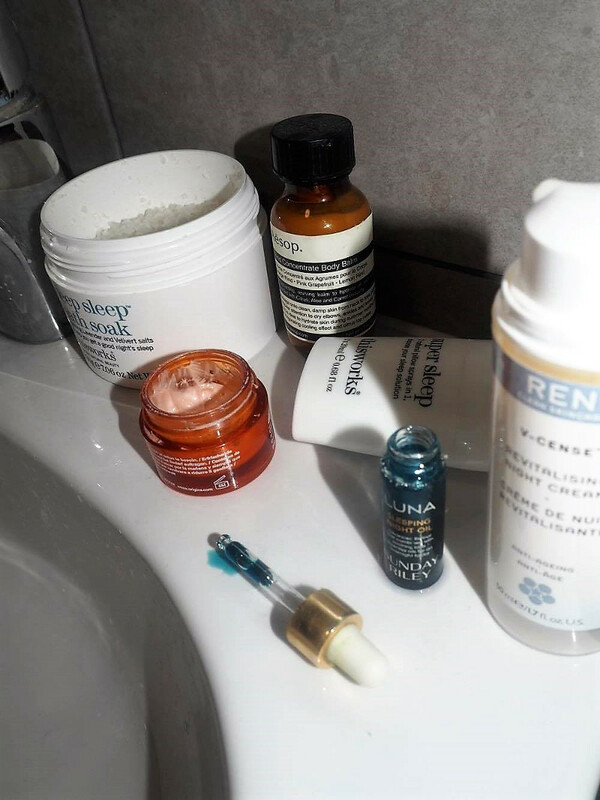 Rotating between the Kiehl's Avocado Eye Treatment and Origins Ginzing Eye Cream; both are refreshing, creamy and smell lovely. 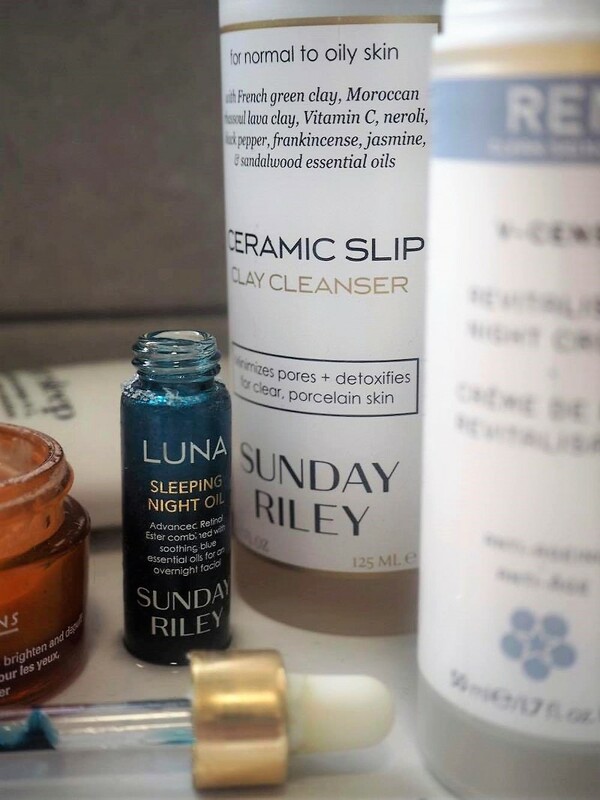 Sunday Riley is a cult brand I lust after on the daily basis but am typically held back in investing by my conscience (and bank balance), but have acquired a few samples over the last few years to tempt me. 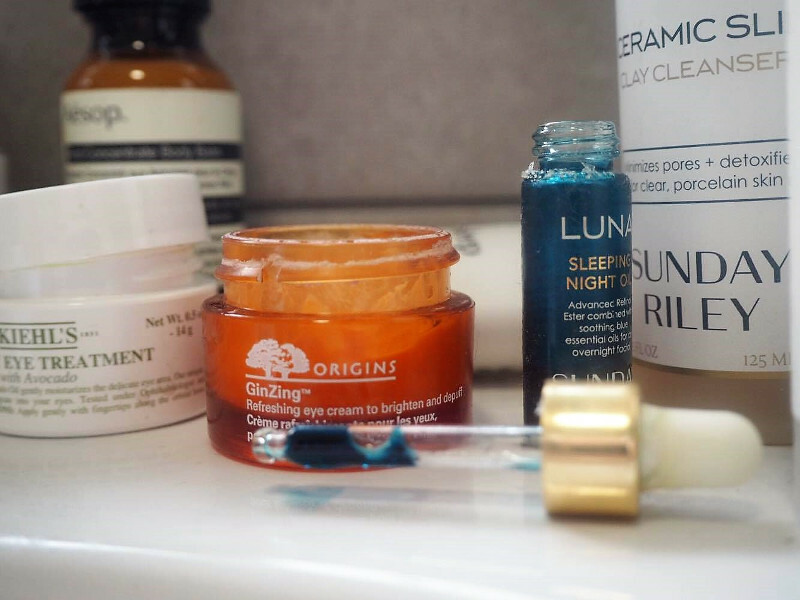 The Sleeping Night Oil is a strong blue elixir (probably best it's only evenings that you apply this as the paranoia of being blue-faced at work is not desirable). It's soothing, promotes cell-renewal overnight and, most importantly for me, neutralizes free radicals that you encounter all day in the city, whether it be on the underground or simply walking from door to coffee shop via the smoggy streets of London. 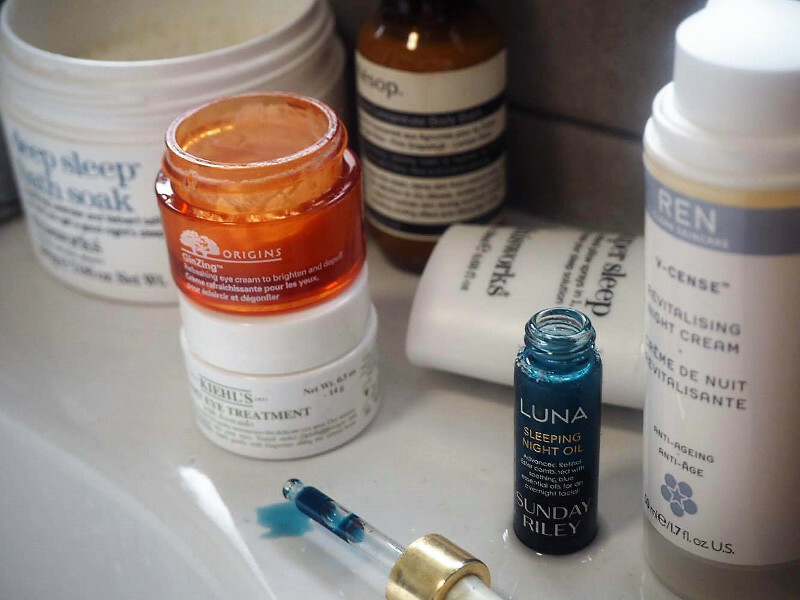 I'm not saying forking out the best part of one hundred pounds on a facial oil is justifiable, especially on an intern's budget, but it's definitely something that I've loved using overnight for all of the above reasons. 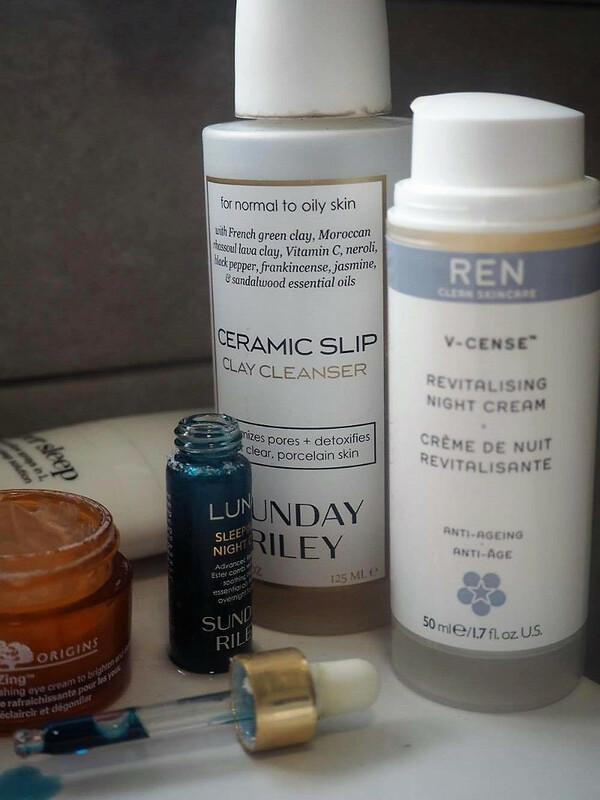 Similarly, the Ceramic Slip Clay Cleanser has been dominating my skincare routine morning and night, being the only cleanser I've used for months as it seems to be a good balance for my skin in terms of not-drying-out but calming none-the-less. 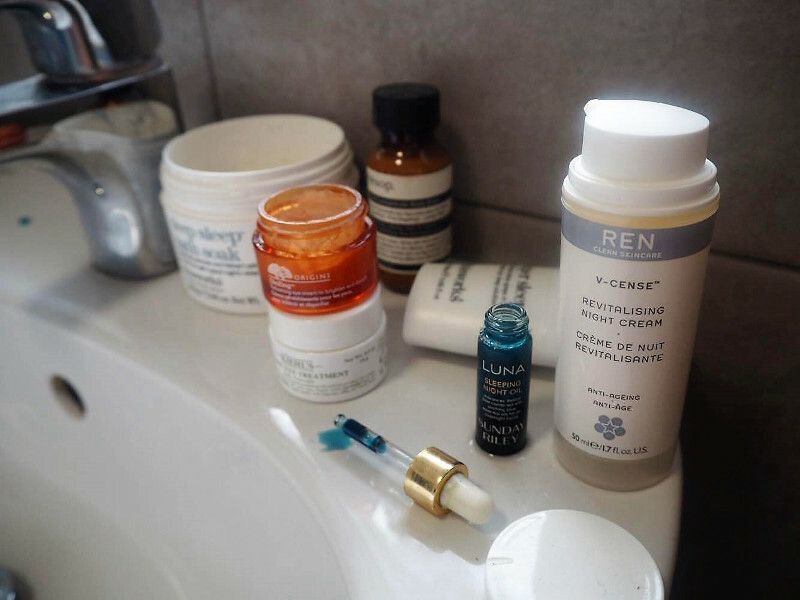 Rewinding for a minute before skincare, This Works' night-orientated formulations go beyond just soothing the face; the Deep Sleep Shower Gel is packed with ultra-relaxing essential oils to soothe a busy mind and restore a bit of harmony while you wash. 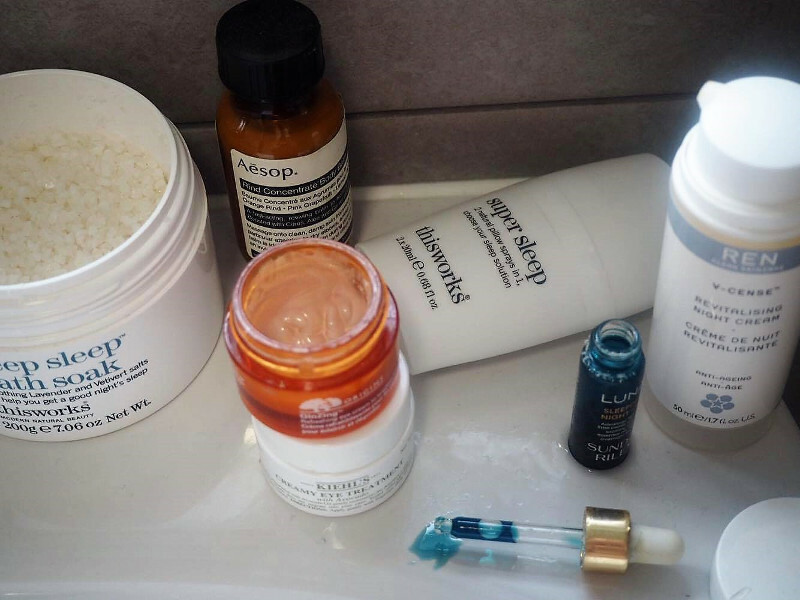 If you're a bath person, the Deep Sleep Bath Soak is your go-to, and is such a luxurious way to up the anti of your soak surrounded by the soothing Deep Sleep superblend (Lavender, Vetivert and Camomile). I've been using This Works sleep sprays for years now, and a firm believer in their effectiveness on improving your quality of sleep (either preventing intermittently waking up through the night or helping you fall asleep in the first place), I even have travel-size back-ups for when I'm travelling or not staying at home. Their newest addition to the sleep range, Super Sleep, is a limited edition offering and has two sides; to be used together or individually depending on your needs. I'd urge anyone who has difficulty sleeping to give this a try. 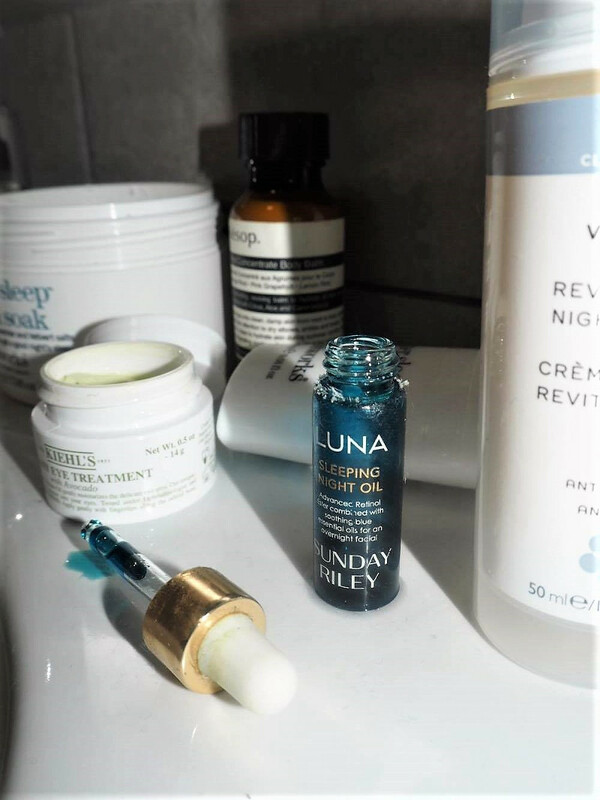 The Sunday Riley LUNA Night Oil is such a cult product, but I've never read a bad thing about it! 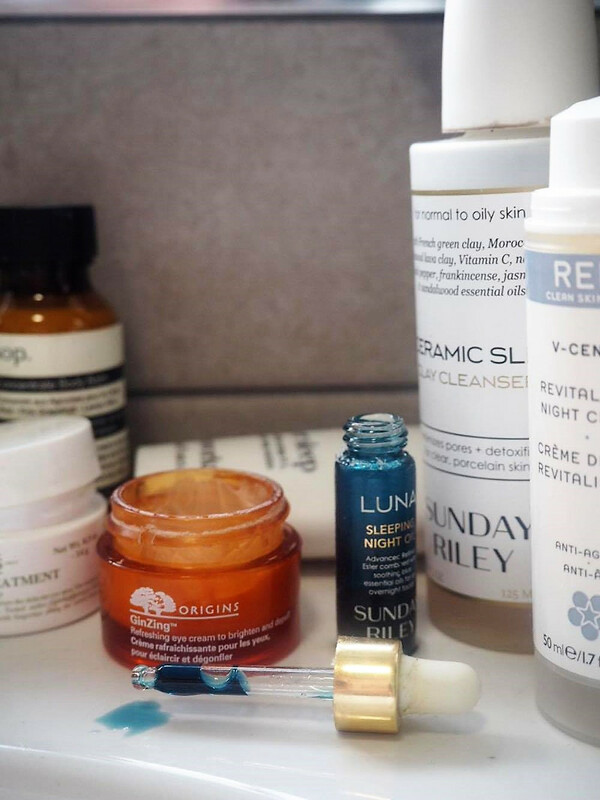 I'm planning on uprooting my skincare soon, and I feel like it alongside the Good Genes serum will leave me with some very happy skin! 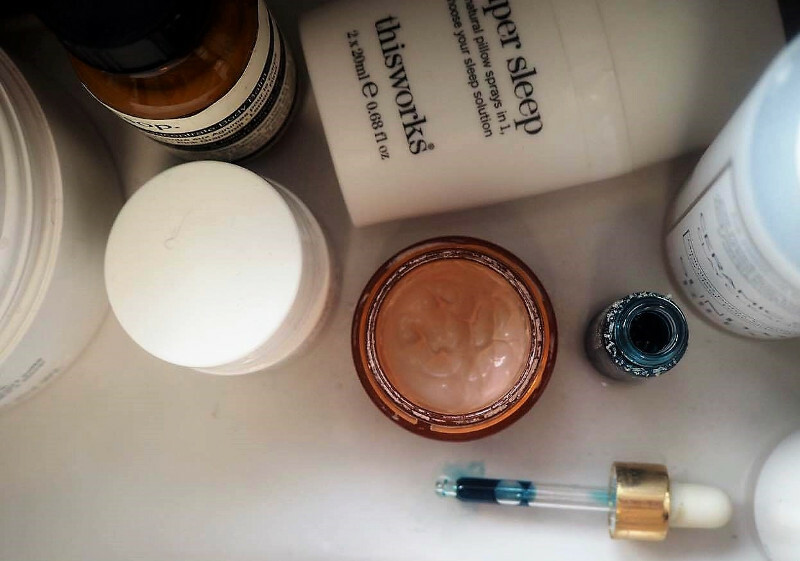 I actually suffer with insomnia and really struggle to get to sleep also, so I'm bookmarking the This Works Deep Sleep Spray for my next spend session!